In November 2017, supermarket loyalty cards were used to trace the source of a large E Coli outbreak affecting mainly men in England. 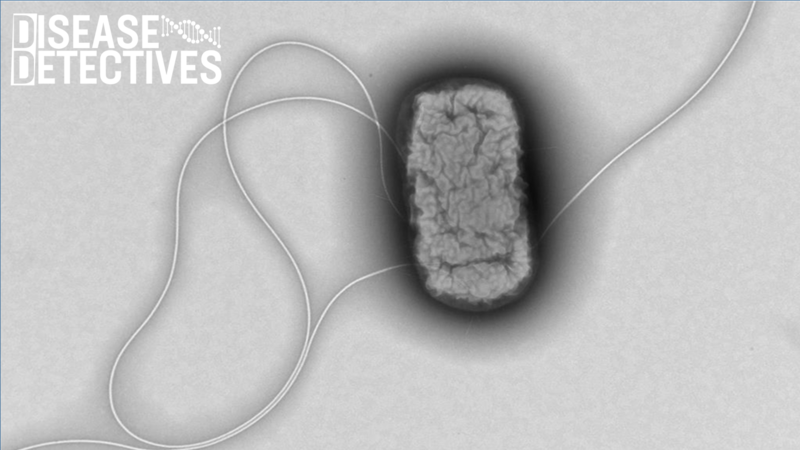 Dr Lisa Byrne leads Public Health England’s surveillance of two key bacteria that lead to food poisoning – E Coli and Listeria. Dr Kathie Grant heads the PHE Gastrointestinal Bacteria Reference Laboratory. The two work together as part of a larger team dedicated to reducing food borne illness and below tell us how they put the pieces of this puzzle together to find the source. If you’ve ever had food poisoning you’ll know that feeling of mentally going through everything you ate recently, trying to pinpoint what it was that might have made you ill. It’s our job to do that at a national scale. We bring together lots of different pieces of information from the community and the lab to try to find the source of a food poisoning outbreak and then, working alongside other government agencies, ensure that more people don’t get sick. We study and monitor many different stomach bugs – some of which you may never have heard of! While stomach bugs are a part of life, PHE works with organisations such as the Food Standards Agency and the Animal and Plant Health Agency to try and prevent them. Every so often we see a spike in the number of cases. When this happens it is important that we find the link between the cases and the cause of their illness. To do this we need to identify the exact strain of a bug to understand if people have got ill from the exact same source. 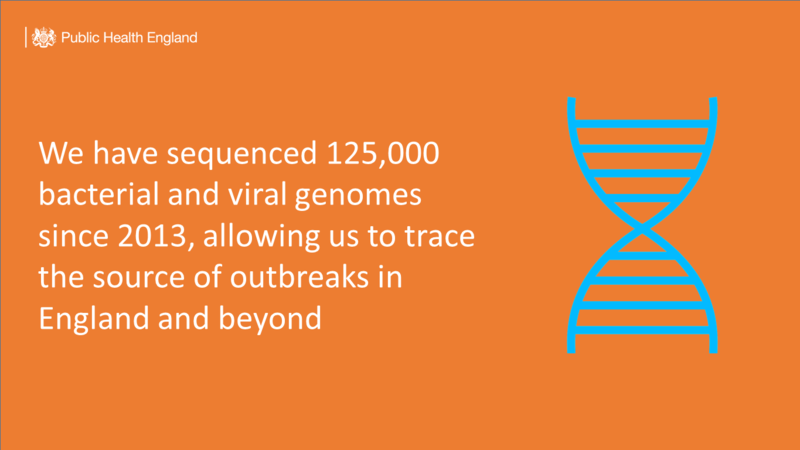 Whole Genome Sequencing (WGS) ‒ a relatively new process for showing us the makeup of a bacterium or virus’s genes ‒ has changed the way we can find the cause of an outbreak and stop more people getting ill. You can learn more about the process and how it works in our explainer blog. Before WGS it could take weeks to identify bacteria and sometimes the bacteria could be missed. This slowed down any investigations as we could not be sure that all the case histories we were taking could be linked to an outbreak – there was a lot of ‘noise’ and false lines of enquiry. With WGS, we can rapidly and accurately identify if bacteria of cases are the same strain and rule out people from our investigation who just happened to be ill at the same time, but with a different illness. It has also expanded what the word ‘outbreak’ means as we can link cases across several years and different countries, meaning we can more accurately piece together a picture of how something in the food supply chain impacts human health. Scientists working in the Gastrointestinal Bacteria reference laboratory at Public Health England. The team are processing samples from people who have reported gastrointestinal symptoms, to understand the exact cause of their illness. Identifying the source of an outbreak is a lot like putting together a jigsaw puzzle, combining multiple pieces of evidence to get the full picture. Sometimes, a common source is obvious, such as when a group of people get ill after eating the same meal, at the same restaurant, on the same day. But other times, we need to use an arsenal of investigative tools, as was the case in a recent E coli outbreak. In November 2017 our surveillance system alerted us to 12 cases of E coli O157 – (a particular form of E coli), over a six week window. E coli O157 is a relatively rare cause of food poisoning, with only about 700 cases a year, but it can cause a very severe illness. Because of this, any case of E coli O157 identified by doctors and laboratories must be reported to Public Health England. We monitor the number of cases with our surveillance systems to find any patterns. Very quickly our reference laboratory used WGS which showed that the cases had the identical genetic “fingerprint” and the work began to trace the source of infection. The majority of people who became ill were men, which was unusual as E coli outbreaks are often linked to salad items ‒ traditionally more likely to be eaten by women. It took a few rounds of interviews – carried out by colleagues in local authorities – to zero in on the potential source of food poisoning, and a picture started to emerge that implicated burgers from a particular retailer. We asked the supermarket to analyse the loyalty card records of those who had become ill, to help identify the particular burger product the cases had eaten. As you can imagine, there were many different types of burgers supplied by the supermarket and it’s often difficult for people to remember exactly what they ate. Working with the Food Standards Agency we were able to identify that all the cases had bought a particular brand of burger, leading to a product recall to ensure others didn’t get sick. The recall involved removing all the suspected batches of burgers from the supermarket shelves. The supermarket also contacted people who had bought the burgers, advising them not to eat them and return them for a refund. Sometimes, as in this case, we can rapidly find what is making people ill and quickly remove it from sale. It’s an exciting role and we get a real sense of satisfaction out of using our skills to help people in this way. Other times it can be more frustrating – some outbreaks remain unsolved and it’s a real worry that people will get sick because we can’t eliminate a threat from food distribution. The role really keeps us on our toes. Our surveillance systems mean that we have a good sense of patterns of illness across the year and how we can intervene to stop people getting unwell - but changes to food habits can catch us by surprise. For instance, raw milk has become more popular recently, bringing with it all the disease risks you would expect from a product that has come straight from a cow without any treatment to kill off bacteria! In another case, eight people in the UK were affected while on holiday in Germany that was related to seeds. The seeds were decoratively used as a garnish on salads and were difficult for cases to remember eating. Nearly 1,000 people in Germany got ill in that outbreak and one of the approaches by authorities was to use tourist photos of food to try and identify the common item in meals that could be making people sick. Solving food borne illness outbreaks can be a real challenge, but by using a variety of the different tools available to us we can quickly intervene to stop people getting ill. This is a brilliant case study. Truly a modern detective story and a great example of how using very new sources of data can solve an outbreak problem. It should be used in teaching for health workers - way more interesting than many of the examples used. A similar approach based on electronic billing card information was used for sub-outbreak in a cafeteria as part of the mentioned German EHEC outbreak: Wilking et al. (2011) available as https://wwwnc.cdc.gov/eid/article/18/1/11-1044_article . Such data sources are indeed very valuable to eliminate recall biased inherent in food-consumption surveys. This is why I have no problem with tracking systems or Big Brother watching me! We need to be mindful of Information Governance but what a fantastically simple and efficient way of preventing further illness.